from Cinedigm. Co-starring screen and music legend Kris Kristofferson (A Star Is Born) and Dakota Fanning (The Runaways), the drama is based on the acclaimed debut novel by Willy Vlautin. The Motel Life also features animation by award-winning animator Mike Smith. 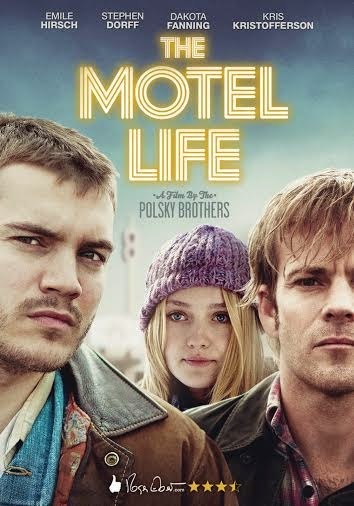 The Motel Life featurette, an illustration gallery and trailer. This award-winning film is a searing and profound examination of brotherhood set in the timeless Sierra Nevadan frontier. Frank (Emile Hirsch, Into the Wild) and Jerry Lee (Stephen Dorff, Somewhere) are brothers who get by on telling fantastic stories and creating rich illustrations. When Jerry Lee is involved in a hit-and-run accident, the brothers are forced across the state to the home of Frank’s old flame, Annie (Dakota Fanning, The Twilight Saga). While they seem safe from the law, Jerry Lee’s instability and all-consuming guilt render their future increasingly uncertain. I knew not to watch it with my hubby, because he isn't into this kind of movie so I invited my sister down to watch it with me. I love the story line and how by the end of the movie it truly makes you think. I love the beauty of the brothers relationship. My only complaint is the movie is def. slow paced. I felt as if I was waiting forever for something to happen. With that being said the story itself and the acting more then make up for the slow pace of the film. Its one of those movies though that I don't think you would pick up to watch a 2nd time.